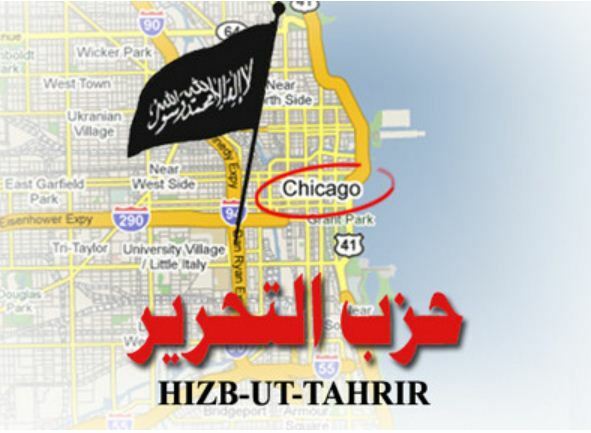 Hizb-ut Tahrir was formed to establish the universal Sunni Caliphate. in 2009 Follewed with their 2011 Conference in Chicago this past June. This report from The Investigative Project on Terrorism is outstanding. A radical Islamist group which claims a presence in nearly 50 countries is so confident it can help establish a global Muslim government – or caliphate – that it distributed a draft constitution during a recent conference outside of Chicago. HT is an international movement to establish a global Islamic state, or caliphate (Khilafah). Although it is officially committed to nonviolence, HT preaches a virulent brand of hatred for the United States, and for Western democracy in general. Its alumni include such violent Islamists as Khaiid Sheikh Mohammad, mastermind of the 9/11 attacks, and the late Iraqi jihadist Abu Musab Zarqawi. Hizb ut-Tahrir has been described as a “conveyor belt” of terror. “And they see the return of Islam,” he warned. “And this, brothers and sisters, is the shaking [of] the thrones.” Islam’s foes “see the coming revival of Islam, and they know what that means and they know what it means for their policies,” Imam said. At the conference, HT activists distributed a brochure detailing how the Muslim state would be governed. The document is “to be studied by Muslims while they are working to establish the Islamic State that will carry the Islamic da’wah (proselytizing) to the world,” it says. The document would govern “the Islamic State in the Islamic world” and does not target individual countries. The pamphlet, entitled “Khilafah State Structure: Introduction to the Constitution,” contains charts illustrating how a caliphate government would function along with a draft constitution. The Treasury would be divided into two divisions: one handling revenue, which includes a “War booties Agency,” and the other covering expenditures, which includes both a “Dept. of Jihad” and a “Director of Jihad Office” on its organizational chart. Read it all. Meanwhile our friend at Acts 17 Apologetics, David Woods, captured the video. Clearly our United States Government is watching these very dangerous and very committed jihadists. We must also watch them. We must defeat them. We must actively follow the One whose trumpet never sounds defeat. We must be warriors. This entry was posted in Defending Christianity, Jinad/Shariah. Bookmark the permalink.